Em Strang distrusts labels. For her “Eco-poetry” carries connotations of Green activism, yet she accepts her work is “ecological”. Undoubtedly a feminist, she won’t have her work so named. Equally, she is certain that she is not a nature poet, and though her work has roots in mythology and in storytelling she is wary of these definitions. If that makes her sound “difficult” then her reasoned response to such quick categorisation is worth considering. which testify to her refusal of normally-accepted hierarchies. Strang rejects “nature poet”, considering “nature” a human-generated binary, a them and us which removes our own species from the mix. making a clean meal of my eye’s meat. It’s good to be useful. You might consider this surreal, you might think it ironic; with an opening quotation from a contemporary Syrian poet, fairly you might have weighed up the political. Jim Stewart had also rejected the label “nature poet” for himself, despite his beautiful verse so often being grounded there. “John Clare was a nature poet”, he believed, and likely Clare would have found that label a good fit. Ted Hughes, by comparison, “used nature to explore his own cruelty” through poetry. Em Strang ‘s lines also explore cruelty, though not particularly her own. 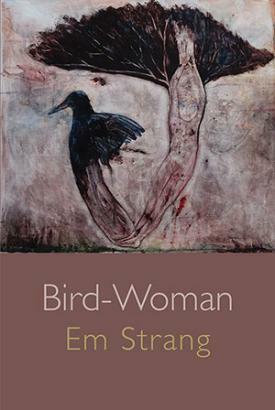 Pantheistic, pagan, visionary and shamanistic qualities are undoubtedly present throughout Bird-Woman, but thankfully none of the twee, prettied up varieties which, alas, seem fashionable in certain easily-lit places. Strang notes that beauty and cruelty co-exist and indeed often overlap in our shared world. The simple aphorism “nature can be cruel” forgets the no less true human part of that pattern. Strang is a prison tutor, and she writes respectfully and holistically of that experience here too, and without the patronising naïveté of false familiarity. In the cleverly-titled “Doing Bird”, which sits opposite one of her excellent “Blackbird” poems (incidentally, quoting Hughes), she takes her shape-shifting and equalising from birds to “the incarcerated”. This triggers a particularly moving sequence of poems, which does not flinch from the cruelty of that state, nor that meted and received by the men. Again, no pastel romanticisms and convenient myths; “Adumbrate” indeed. Myths and also myth-making lace the collection. She draws from world mythologies including a Siberian fire spirit (“Tog Mahoni”), but she has also created her own, Plath-like in its recurrent, consistent symbolism. We have already met Hughes, and her Syrian contemporary, but Neruda is here, Whitman, Foucault and more; it’s hard to encounter read those blackbirds and not recall Rilke. So, we know her sources are cosmopolitan, wide-ranging and both ancient and modern. In “Riparian Zone”, she grounds her poem in Sindh Province’s disastrous 2010 monsoon. The editorial flow throughout the book is in itself spellbinding. We know that her skilful editing here is no fluke, as she is at the helm of the remarkable Dark Mountain project. Bird-Woman is Strang’s first full collection, but it is preceded by two lauded pamphlets. All this we know. We still have no label, other than the poet is Dumfriesshire-based. Excellent. If Strang’s poetry is problematic, resisting facile categorisation, then I have no problem with that (nor I imagine has she). Bird-Woman should be read in a spirit flying open to possibilities and questions, rather than one already pigeonholed.